Dudes Gold Cross has earned 2 PHBA open halter points. Dudes Gold Cross is the sire of 20 PHBA performers and 16 AQHA performers, as well as 5 colored paints in tobian, overo and tover, including too tardy dude (273 AQHA and 134 PHBA points: AQHA high point junior trail champion; high point trail mare; high point junior western finding champion; high point western riding mare; PHBA reserve world champion junior western riding horse; AQHA superior western riding and trail; PHBA ROM in western pleasure, w3estern riding and trail; 3rd, PHBA world champion hip 4-yeay-old mares; 5th PFHBA world championship western pleasure maturity, dandys sonny dude (547 PHBA ROM halter stallion of the nation), dudes gold rose (342 PHBA points: PHBA ROM halter & color; 6th, PHBA ROM world championship 2-year-old youth mare), dudes golden dollar (135 PHBA points" top 10 PHBA world championship open & amateur color) dudes glamour boy ( 115 PHBA points" top 10 PHBS world championship yearling geldings), diamond eyed blondy (68 PHBA points in halter, western pleasure hunter under saddle & color: ROM halter) dudes dream money (28 PHBA points I hunter under saddle western pleasure horsemanship and halter), Mr. ymanns dude (5th PHBA world championship breakaway roping) shesa golden dude (5th PHBA world championship 3-year-old mare; AQHA point-earner) dudes gold dream (42 PHBA points in halter, color, western pleasure & showmanship; AQHA point-earner) ima sassy sierra (35 PHBA points in horsemanship equitation hunter under saddle, trail & showmanship), dudes gold bars (14 PHBA points: 3rd PHBA world championship 4-year-old stallions), dudes miranda (11 PHBA halter point) jolies blond baby (PHBA point earner in hunter under saddle & road hack) dudes snow bunny (PHBA halter point earner), golden bottle (PHBA halter point-earner) miss gold cross lady ( halter point-earner). 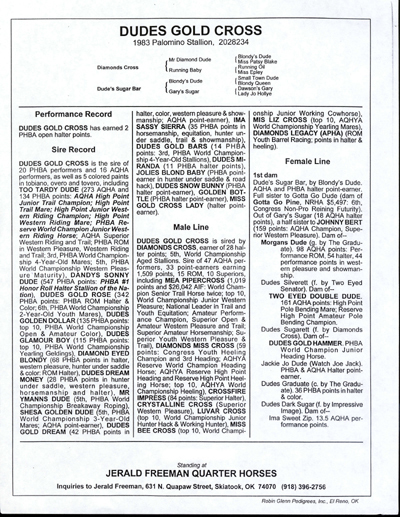 dudes gold cross is sired by diamonds cross earner of 28 halter points; 5th world championship aged stallions. 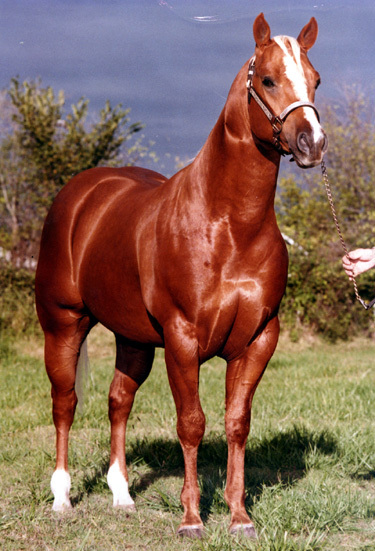 Sire of 47 AQHA performers, 33 point-earners earning 1,059 points, 15 RLOM, 10 superiors, including mea pipercross (1,019 points and $26,042 AIF: world champion senior trail horse twice; top 10 world championship junior western pleasure national leader in trail and youth equitation amateur performance champion, superior open & amateur western pleasure and trail superior amateur horsemanship; superior youth western pleasure & trail) diamonds miss cross (59 points: congress youth heeling champion and 3rd heading; AQHYA reserve world champion heading horse; AQHYA reserve high point heading and reserve high point heeling horse; top 10 AQHYA world championship heeling), crossfire impress ( 84 points: superior halter ), crystalline cross (superior western pleasure), luvar cross (top 10, world championship junior hunter hack & working hunter) miss bee cross (top 10, world championship junior working cowhorse), mis Liz cross ( top 10, AQHYA world championship yearling mares) diamonds legacy (APHA) (ROM youth barrel racing points in halter & heeling). 1st dam dudes sugar bar, by blondys dude. AHQA and PHBA halter point-earner. Full sister to gotta go dude (dam of gotta go pine, NRHA $5,497: 6th, congress non-pro reining futurity). Out of Garys sugar (18 AQHA halter points), a half sister to Johnny Bert (159 points" AQHA champion, superior western pleasure). Dam ofMorgans dude (g. by the graduate). 98 AQHA points: performance ROM, 54 halter, 44 performance points in western pleasure and showmanship. Dudes silverett (f. by two eyed senators). Dam oftwo eyed double dude 161 AQHA points: high points: high point pole bending mare; reserve high point amateur pole bending champion. Dudes sugarett (f. by diamonds cross). Dam ofdudes gold hammer. PHBA world champion junior heading horse Jackie Jo dude (watch Joe jack). PHBA & AQHA halter point earner, Dude graduate (c. by the graduate). 36 PHBA points in halter & color. Dudes dark sugar (f. by impressive image). Dam ofima sweet zip. 135 AQHA performance points.